Do parents love their biological kids differently than their step kids? This is a topic that has been on my mind for a few years, but I have been very hesitant to write about it. Partly because the title may offend some people, and partly because it is a very touchy subject. However, for any one who has been reading my blog for the past 5 years that I have been writing knows that I don’t often avoid a topic because it is difficult. I have written about my difficulty with my step daughter, I have written about Lesbian Bed Death, I have written about Menopause in all its glory, and I have written about my brothers death. Nah, I am not one to run away from a difficult subject. So, that being said, I have been thinking about this step children vs. biological children issue for some time now. But it has really been brought to the forefront even more as my oldest biological child gets ready to graduate High School. I have two biological kids, Zachary and The Genius (I don’t use their real names until they are 18). I have two step kids, Katarina and Brandon. As I have written about, Katarina and I do not have a relationship (her choice). In fact, she doesn’t even acknowledge me anymore. As far as she is concerned I do not exist……it is very sad, but it is what it is. However, Brandon and I have a beautiful and loving relationship. It did take us awhile to get there, a few years in fact I have come to realize that it is quite normal for step relationships to require time to build. I suppose if you become a family with step children aged 5 and below this relationship can bloom faster, but when the kids are 7 years old and up I think there is much more patience and time required to have a great relationship. I mean, think about it, Brandon had only seen me as his mom’s friend coming to visit. We got along, but I wasn’t an Aunt, or relative, or someone he felt “required” to care about, I was just his mom’s “friend”. Then when we moved in together we didn’t fit the traditional family “mold”, so that also had to be navigated carefully. But over time, Brandon and I have grown to love each other very much, and I think of him as my son, and he thinks of me as a parent. I cried when he graduated. He moved to Tennessee last year, and for the first 8 months or so, I just felt like something was “missing” from the house. I have gotten used to it now, but I still talk with him when Karol chats with him on the phone about once a week. 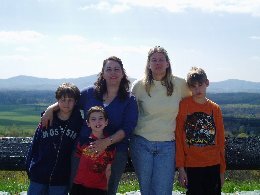 Our first “family” photo, circa 2007. Even then, Katarina refused to be in the photo…. You can see from the photo that we were still not really “blended” yet, but we had only been a “family” for a year, so we were still figuring it out. But even though Brandon and I have a great relationship and I love him with all my heart, and I say I love him just like I love my own, that is a difficult thing to measure. I do love him, and I would be devastated if anything happened to him, but…. As Zachary’s graduation from high school approaches I have been more and more emotional. I just want to hold him and hug him and NEVER let go. I know he is about to end the “childhood” phase of his life. He has pulled away from me in the past few years as he has become an older teen, which I know is totally normal, but I can’t say it hasn’t been a little painful. Oh, he still indulges me with a hug before he leaves the house, and tolerates me sitting next to him sometimes when we watch a movie together, but he is becoming an adult. He is about to pull away even more, and become his own person with a life completely separate from mine. Just writing that makes me cry. I didn’t have these same feelings with Brandon when he graduated and was ready to move into adulthood. So those feelings I am having make me wonder about love for biological children vs. love for step children. As much as I love my non-bio son, (and I call him my “son”, NOT my “stepson”), it isn’t exactly the same depth as my love for my bio sons. I often wonder if this would be different for me if I had been in Brandon’s life when he was smaller. Karol tells me she loves my bio kids just the same as her bio kids. Sometimes I wonder if that is true, but I can’t feel her feelings, so I can’t doubt her verbally. But maybe she does. When we got together, my kids were 5 and 7. I KNOW that she is especially close to The Genius, but he was such a little boy when they met (he was 4) that maybe his young age allowed them to bond together more than I did with Brandon who was 9 when I met him. Brandon was already going into 5th grade. He wasn’t that “cute” kindergartener anymore. If I had met him when he was 4 would I feel differently? Would we be closer? Would I have the exact same love for him as I do for my bio kids? Or is that about babyhood, and taking care of that completely dependent human being?? I do believe that it isn’t about the act of pregnancy and delivering a baby, because people who have babies through other methods than conception, pregnancy and delivery have that intense love for their babies that I feel for the babies I carried and delivered. So it makes me think about the love for bio kids vs. step kids. It is a tricky and sensitive subject. I have googled it, and tried to read about it, but to be honest I don’t think very many people want to talk about things that make them uncomfortable, so I didn’t find much beyond some threads on a few forums about raising step kids, or parenting. Not being one to shy away from uncomfortable topics, I decided to talk about it here. So for me the bottom line is that as much as I adore my non-bio son, it just isn’t the same for me as with my bio kids. After really thinking about and analyzing this , I have come to the conclusion that it doesn’t matter. I have always done the best I can to treat all three boys equally. Of course there are differences in the way they have been parented, because they are different people, but none have received any “more” than the others. That was always VERY important to me. It was important that all the kids feel as though they were equal in our family. It is funny though because when I ask them if they were treated equally, the older two say we spoil the youngest one, and the younger two say the oldest got more privileges. The middle one always says the other two had it better than him. So when I look at it from that angle, I can say without a doubt we are a TOTALLY normal family and they all felt loved and cherished, because that is what ALL kids say….. that the others had it better than them. So after all the dissection, and analyzing, and agonizing over my feelings, the fact that all my kids felt loved and adored, and taken care of, I am thankful that I was able to (with Karol) parent them well enough that they feel that way. My parents divorced when I was 2, and started new relationships right after, one of which is still happening (my dad and my stepmother, they celebrate their 20th birthday this year). So, speaking in my child-of-divorced-parents-who-got-married-again point of view, I’d say that I have a big RESPECT for my stepmother, beyond the love, she is a great woman, I usually take her as a role model rather than my mother, since my mother is bipolar and just a big mess, but I have some “liberties” that I only feel comfortable in having with my mother and my dad. I don’t know, I don’t feel like I can yell at her, of have a fight with her like I have with my biological parents, because you gotta have that RESPECT before anything. But we are happy, we have a happy life together, she does a lot to make me happy, and I really appreciate it, specially because I can’t count on my mother for much besides making me miserable. I was lucky to have her, really lucky. It is not the same love we have for our biological parents because I don’t know, it is deeper somehow, and we have genetic traits in our personalities that assure they understand me better and I understand them too. But is a big love and a big respect too, is a part of the family, is some one who really chooses to love you in the day to day life, besides anything. I’ve seen firsthand that my parents are capable of loving us all equally. In fact, writing from a child’s perspective rather than the parent’s, I’ve seen my father and mother try even harder to convince the adopted children that they love them. Blended families are tough, but in my opinion, they’re completely worth the time it takes to make the big love smoothie. Helleanor, thank you for your comment. I completely agree that a blended family is worth the time it takes for that smoothie! I will say that I absolutely adore my step son. And I am pretty sure he adores me. I have worked hard to build a great relationship with him, and I totally did what your parents did with their non bio kids. I was always worried about making sure he knew I loved him. It is not an easy thing to navigate, but it is worth every bit of effort to have that relationship! Pingback: How does it feel when your oldest child graduates from high school? Logically you’re more prone to have unconditional love for your biological child or adopted child because they’ll have unconditional love for you. In your head you realize they NEED you. They’ll love you and be around no matter what happens with you and your spouse. You could pass away while they’re 5 and they’ll still speak of you and ask relatives about you for the rest of their lives.. Your stepkids have parents. You are a VERY loving extra. Honestly the love you give to a stepchild though is conditional; it depends on their parents and how long you’re with their family. I’m not saying you can’t treat them the same as if you do love them unconditionally… But you honestly don’t.. I would take a bullet for my stepkids unless that would mean leaving my bio or adopted child without a mother. . I would take a bullet for my child no matter what.. But unless it ever comes down to that, which it probably never will, the degree to which you love them will probably never be relevant. Kevin, unfortunately that does happen some times! Makes me angry and quite sad to be honest! I am very sorry that happened to you and your sisters.